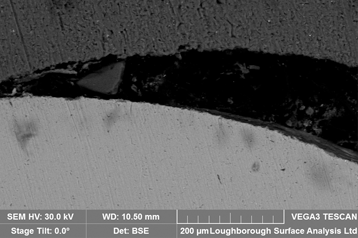 Scanning Electron Microscopy (SEM) is an imaging technique where a focussed electron beam is rastered across the surface of a sample to create several different types of emission. The first is secondary electrons, whereby the incident electron beam hits other electrons directly and causes the secondary electron to be emitted. The second is backscattered electrons, whereby the incident beam of electrons are effectively “ricocheted” off of the sample into a backscattered electron detector. Another type of emission is characteristic X-rays, which can be used to identify the elements present (and their relative abundances) in a sample. This is done with an Energy Dispersive X-ray detector (EDX).